Students in Kindergarten through fifth grade explore melody, rhythm, form, expression, and harmony in music. With an introduction to pitched and non-pitched instruments, and through vocal development and movement, students are introduced to works from a variety of musicians and composers. All students in first through fifth grades participate in annual choral music and drama presentations. 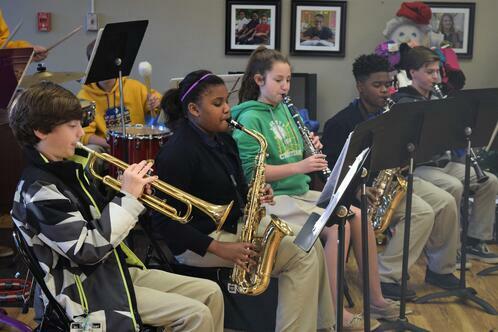 Middle School students further extend vocal singing skills and develop an appreciation for genres of music and instruments from many different cultures. They also participate in group classes in piano and guitar and have an opportunity to participate in the annual musical production. In the past, the Middle School Drama team has presented musicals such as Beauty and the Beast Jr., Annie Jr., and Aladdin Jr. Instrumental music instruction is available for a range of orchestral instruments for students in fourth through eighth grades. Click Here to learn more.